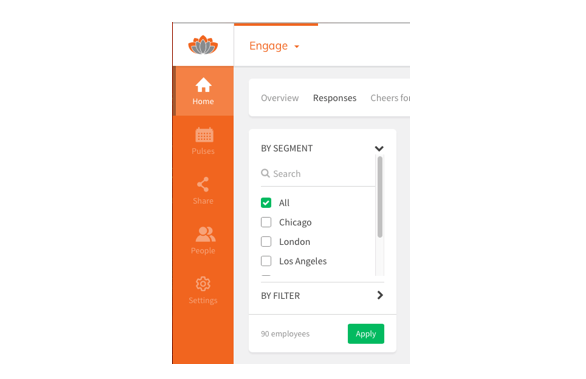 Since culture can be specific to departments, locations, tenure, and more, TINYpulse Engage gives you the ability to create segments and filters within your account to see pulse specific groups of employees an slice and dice results accordingly. Administrators can slice and dice survey data in two ways with Engage; by segment and by filter. Before you get started, be sure to understand the purpose of each. Segments are the primary way to categorize your workforce. If you could only break your employees down in one way, how would you do it? By location? By department? By employment status? You'll have to make this decision yourself but once you do, you'll be able to see TINYpulse Engage survey results for your entire company or by each individual segment. For example, if you have multiple locations, you can group all the employees in New York, Shanghai, and London into separate segments. Then you can easily see your overall happiness results filtered by office location. Of course you can segment your workforce in any way that you'd like, but whatever you decide, it will help to pinpoint specific areas of your company that are high-performing, exhibit opportunities for improvement, or have specific needs. Please note that for anonymity reasons, each segment must have at least five users in the segment. The segment can't be created if less than five users are added. Lastly, employees can only belong to one segment. Want to break down employees by additional characteristics? Keep reading because filters are for you. Filters let administrators further categorize employees. Filters are limitless and employees can belong to more than one. Some examples of filters include high performers, low performers, gender, tenure with the company, role, etc. Create filters according to the characteristics and categorizations that are most important to you. Want to view the overall happiness scores of your highest performing employees? How about viewing quantitative data by female responders in your office? Just create a filter and you're good to go! Now that you know the difference between segments and filters, it looks like you're ready to get started! Create a segment in the Users and Settings -> Groups page. Just enter the name and click Add Segment. You can also view the number of members, update the name, or delete a segment if you don't need it any longer. After creating segments, administrators can add in employees by proceeding to the People page in Settings. Select the appropriate segment for each user using the dropdown list to the right of their name. Once you select the appropriate segment, the user will be updated automatically. For bulk segment assignment, you can forward us a spreadsheet for a quick upload or assign the segment when inviting new employees to TINYpulse. Similar to segments, filters allow you to further organize members by characteristics. To access and manage filters, go to the Settings -> Groups tab and create them the same way you did for segments. Create the filter, then go to the People page to assign employees a filter. Employees can only be added to one segment, but as many filters as you want. We don't have to tell you it's important to pulse your entire organization. Understanding how employees are feeling and getting a picture of the overall health of your organization's culture is invaluable. But it's also important to collect targeted feedback from certain locations and work groups, and that's where pulsing by segment comes in. In addition to the main Engage pulse question, you can also send additional pulses to your segments. Learn more about segment pulsing in detail. Once users are assigned to a segment and/or a filter, you can select and view data in a more sophisticated way. Just keep an eye out for a filter on the left panel of the responses, suggestions, and Cheers tabs. Choose the desired segments, filters, and boom, you're done. You can also filter by segment with Visualize as well. Note: To protect anonymity, when a user is assigned to a particular segment is changed from one segment to another, their past responses will remain with the original segment. Their responses will only be included in the new segment for all surveys going forward, but will not be moved retroactively. Viewing data by segment allows you to view both the quantitative and qualitative survey responses; graphs, numbered responses, and additional feedback. You can also view suggestions, Cheers, and Visualize data by segment. Viewing survey responses by filter only displays quantitative results and you won't be able to see the qualitative data to protect the anonymity of the responders. Responses viewed by filter will display the average response score and response rate only, without the histogram or additional feedback. However, the quantitative data is still useful to track certain factors by demographic, like happiness. 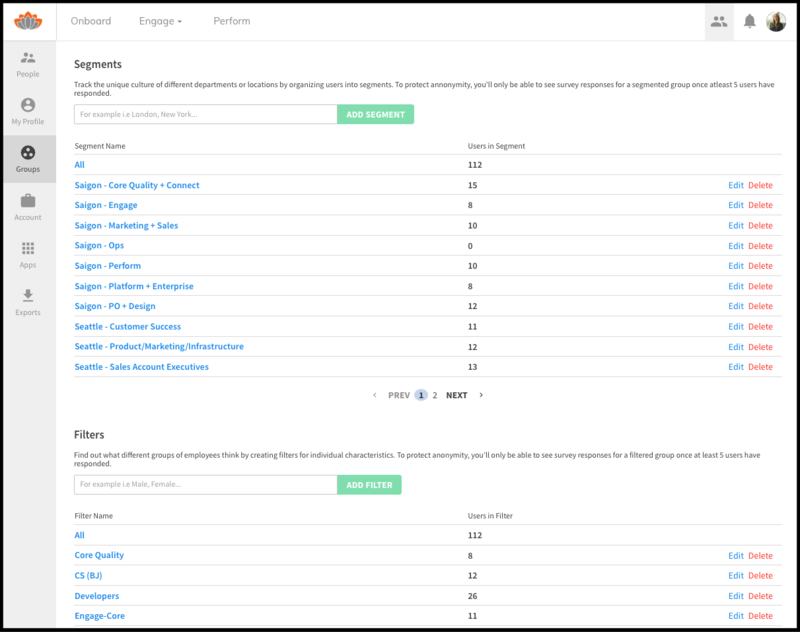 You can see how segments compare against one another by going to the Compare area of your dashboard. Change the TINYpulse for the week of... dropdown menu to see different periods in time and different questions, or use the filter on the left to see just certain segments.